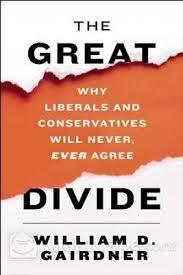 One of the virtues of William Gairdner’s latest book, The Great Divide: Why Liberals and Conservatives Will Never, Ever Agree, is the historical perspective he brings to the current left-right divide. He sees this divide as reflecting something deep and longstanding in human history, and he tries to indicate its evolution throughout the West, especially in Canada and the United States. He argues that the triumph of the Left has resulted in the West adopting a “libertarian socialism” in which individuals are granted bodily and sexual license even while the state increasingly regulates all or most other aspects of life. He specifically compares this to Aldous Huxley’s prescient dystopic novel Brave New World. Gairdner also is good at delineating the central differences between Left and Right and their ramifications. I think that the nub of the divide is the recognition of human limitations as to both virtue and wisdom, with such a recognition influencing greatly conservatives and influencing leftists little if at all. The final part of Gairdner’s book fairly effectively focuses his arguments on three issues: homosexuality, abortion, and euthanasia. Gairdner claims that conservatism is not an ideology, but his own version of it, as presented in this book, seems a bit too ideological for my taste. By this I mean that his conservatism seems more programatically all-encompassing and rigid than my (and I dare say Edmund Burke’s) sort of conservatism, which is more a philosophical attitude. I also think that it would have made for an even more thought-provoking book if the author had discussed whether the coalescence of the different elements of contemporary conservatism was due to historical or sociological circumstances rather than philosophical or political consanguinity. The book notes, for example, that there are some on the Left who are opposed to abortion, but Gairdner takes that observation no further. I would have been interested in the reflections of Gairdner, an interesting thinker, on what this indicates and why, for example, although there are socially conservative social democratic individuals, there is no such major movement, at least in the United States. I think that broadening his discussion in this way would have shed even more light on the nature of the contemporary Left and Right and the great divide between them.